The Olenacea are a group of trilobites known from the Middle Cambrian to the Upper Ordovician (Harrington et al. 1959). Characters (from Harrington et al. 1959): Exoskeleton subovate to elongate, opisthoparian (exceptionally proparian), micropygous to (rarely)subisopygous, with rounded or spinose genal angles. Cephalon with narrow border, small to medium-sized eyes and in most forms distinct eye ridges; glabella tapering forward, with simple, sigmoidal, or bifurcate lateral furrows (if present); preglabellar field present or absent; librigenae separated by median suture or fused together. Hypostoma probably free. Thorax with 9 to 24 segments. Pygidium with or without marginal spines. [FO99] Fortey, R. A. & R. M. Owens. 1999. Feeding habits in trilobites. Palaeontology 42 (3): 429–465. Harrington, H. J., G. Henningsmoen et al. 1959. Systematic descriptions. In Treatise on Invertebrate Paleontology pt O. Arthropoda 1 pp. O170–O540. Geological Society of America and University of Kansas Press. [LN05] Lauridsen, B. W., & A. T. Nielsen. 2005. 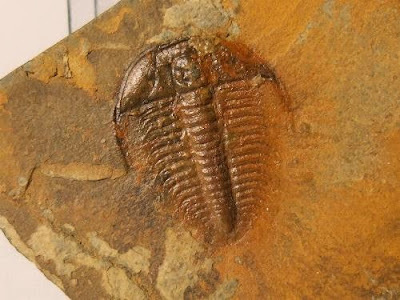 The Upper Cambrian trilobite Olenus at Andrarum, Sweden: a case of iterative evolution? Palaeontology 48 (5): 1041–1056. [S80] Shergold, J. H. 1980. Late Cambrian trilobites from the Chatsworth Limestone, western Queensland. Bureau of Mineral Resources, Geology and Geophysics—Bulletin 186: 1–111.